Nestled in the beautiful mountains of Western North Carolina, conveniently located just 5 miles off I-26 and 30 minutes north of Asheville is Wolf Ridge Ski Resort. A family oriented resort with tremendous offerings for the ski, snowboard and tubing enthusiast. Lighted slopes means the fun can be found day or night. 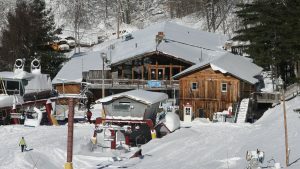 The lodge overlooking the slopes offers 3 fireplaces, cafeteria, gift shop, rental shop and group sales department. Whether you are a beginner or expert, long-time regular or first-time visitor you are certain to find exactly what you are looking for at North Carolina’s premier snow sports facility. Click on the links to view our Web Cam mounted on the lodge, check current slope, snow and lift reports, or view the trail map to begin planning your dream days at The Mountain. Once you take your first ride up a lift your life will be changed forever.